A: To put it simply, I pursued a career in medicine to have a positive impact on other people and be able to help them at their most dire moments. I am not someone who thinks “I was born to be a doctor” but I feel my life experiences and interests have led me to my pathway in medicine. Through the constant evolution of my interests in medicine and biological sciences I became in love with the medical field. Plus, medicine has such a team mentality that I felt my experience in sports, especially football, would help me make an immediate impact and find my niche on a medical team. Q: You've taken your love of the field and intend to make a future in sports medicine, why? inspiration to this day, Coach John Zisa. Q: Why did you chose Johns Hopkins upon graduating Westwood Regional? A: I am grateful to every coach I have had from Westwood Wolverines through Johns Hopkins. In their own way, each has enabled me to get the most out of myself, believe in myself, and make the most of my potential. Coach Straub is a great coach and an even better person who had tremendous success at Westwood. The lessons he instilled in us each day made us better players and, more importantly, better young men. It was tough on me and our team when he left Westwood after my sophomore year. With that said, there was a lot excitement around the Westwood program when Coach Vito was hired, and we had a strong and close relationship, him and I, from Day #1. He motivated me to reach my potential, and instilled a certain work ethic and mentality in me that I leverage every day of my life. Coach Vito was the type of guy you wanted to play for, and you knew he would always have you back and you were in it together. He’s someone that will always be an important figure in my life and I cannot thank him enough for all he has done for me. I think the way the community embraced him and how he embraced it speaks volumes to not only the coach but the person he is. I also spent a lot of high school football practices with Coach Z and Coach O’Melia, two great guys I have a special bond with as well. I can’t put into words what Coach Z has meant and will always mean to me. He gets you to believe in yourself, work through any adversity, and dominate on the football field while having fun doing it. Me and Z could sit there and talk football X’s and O’s or about life for hours on end – we just had, and will always have, an unbreakable bond. 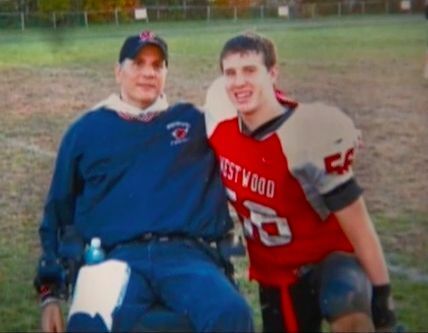 Coach O’Melia was always the constant representation to us of what a tough football player from Westwood High School was and he’s someone that every player he coached respects and loves. A: I am forever grateful for everything Westwood football has done for me. There was nothing like walking across the bridge at Ketler arm-in-arm with my brothers, the kids I grew up with, to represent the community we all took pride in and who loved us and showed up in mass for every game. I wouldn’t trade that experience for the world. I was fortunate enough to go on and have great success in college at Hopkins as a 4 year contributor and 3 year starter on the defensive line. I was a part of a team at Hopkins that won 4 conference titles, while only losing 1 regular season game in 4 years. And, we made the D3 playoffs all 4 years. There are many parallels between my experiences playing football in high school and in college; but in high school, I was able to represent my community and that is and always will be very special to me.